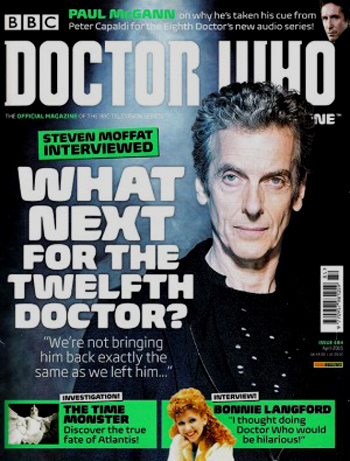 Issue #484 of Doctor Who Magazine features an interview with Steven Moffat who talks about a little about the direction the Twelfth Doctor will be heading in Series 9. Moffat states: "We're not bringing him back exactly the same as we left him, at all. I think that was already evident at Christmas. He's left some of the burden of being the superhero of the universe behind. Also, Peter magnifies anything that is dark. So I'm pushing him - I'm writing quite funny this year - I'm pushing him the other way." He adds: "He's also got a Scottish gloom about him. If you gave him a Matt Smith script, it would come out very, very differently. I think it was great fun to do for a year. But no, that's not how we're going to play the rest of him."